in 2017 we piloted partnership work with AAA, a charity based in the Arc in Hermit Road Park, Canning Town – by running a 3 bike fixing stalls at their Saturday morning children’s cycling club and leading a gentle ride along the Greenway. to fit as best possible with the Woodgrange stall and rides calendars which will shortly be published. 10 & 17 Feb; 17 and 24 Feb; 17 & 24 March;28 April & 5 May; 26 May & 2 June. I have set up two Doodle polls (one for the stalls and one for the rides) and will take the best three sessions. If you would like to help please sign up. It is not necessary to be available for both date in a pair. The only requirement is that there be a sufficient number signed up to run the events – probably 3 for each. Thanks for your help, if you would like to know more please get in touch with me. 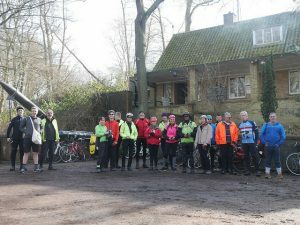 Our next meeting will be 29 January, by which time we should have some more news on campaigning issues and our ride season will not only be published but will have started! Major works affecting cycling have started at the Stratford Gyratory, the Strand East site near the Bow flyover, and Letts Road. This has exacerbated the difficulties of the Cycle Superhighway 2 which was already dogged by works. 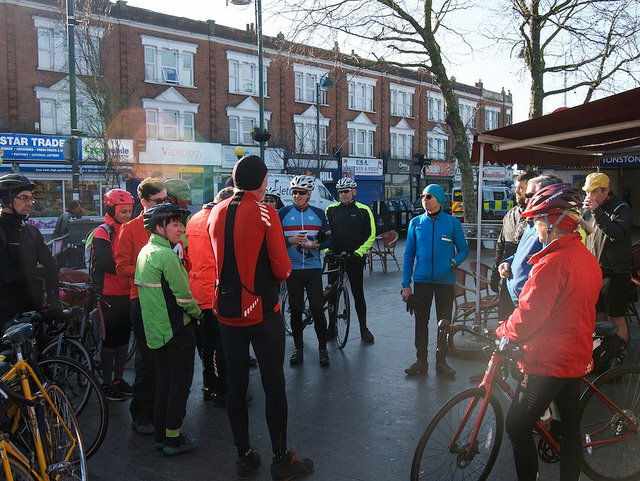 We have been active in seeking measures to lessen the impact (on occasions very severe) on cycling and have brought in the assistance of the LCC, Newham Officers and Councillors and the TfL Development Impact Adviser, who took a ride around with us to see the problems for himself. 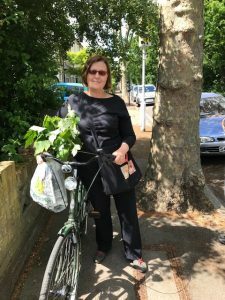 We have prepared a paper on cycling in Newham, inspired by (a) work done for us by “20’s Plenty” showing that Newham lags behind other boroughs in road safety and health and (b)TfL analysis the huge potential for cycling in Newham (which includes four of its top 20 London “Potential Cycle Connections” for the whole of London). 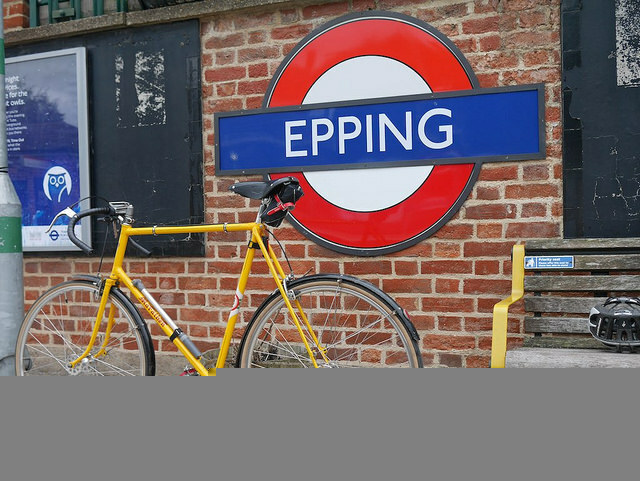 Our paper reviews the approach to cycling in the borough, analyses why the cycling deficit has arisen, and calls for an effective and coherent cycle strategy. The full paper has been distributed to those councillors who have expressed an interest in cycling and is on our website. In the meantime Olawale, our Infrastructure Rep has taken the lead on a number of responses to consultations. 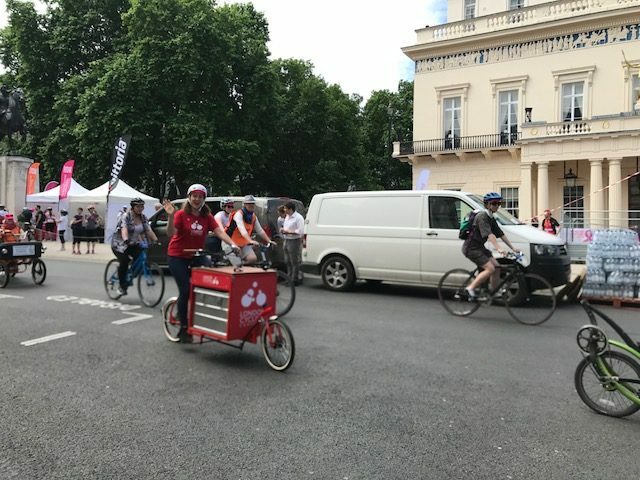 Our general approach is aimed at pedestrian and cycling safety: by promoting segregated tracks and cycle lanes of sufficient width where traffic flow demands; safe junctions; 20 mph on residential roads: creating areas without through traffic; “Copenhagen” style pavements giving pedestrians priority over side roads; and opposition to parking on pavements. A crowded, enjoyable and varied series of rides took place through the autumn. 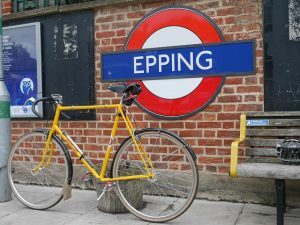 This included another East London Brewery Ride, and a new ride out to Much Hadham (taking in a visit to the Henry Moore Foundation). 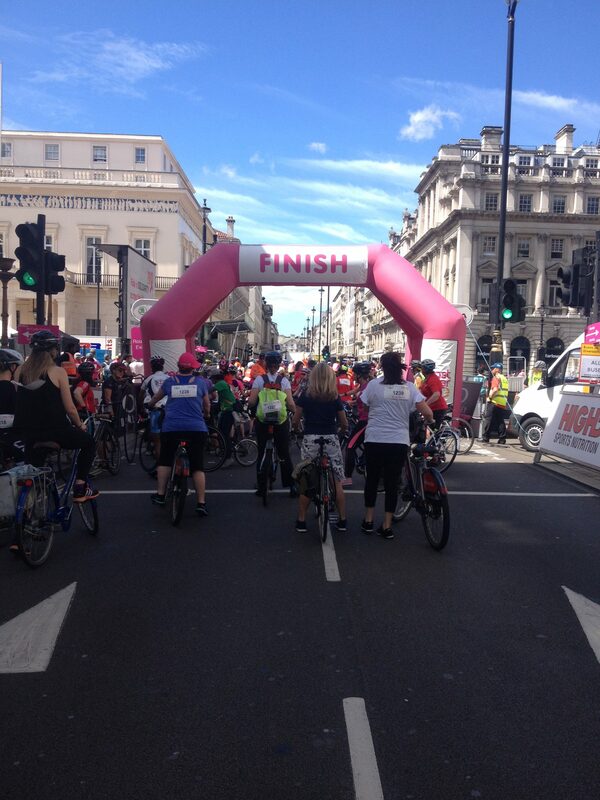 The first Bike from Boleyn Ride of the football season attracted lots of publicity and a variety of cycles. The next will be in April. 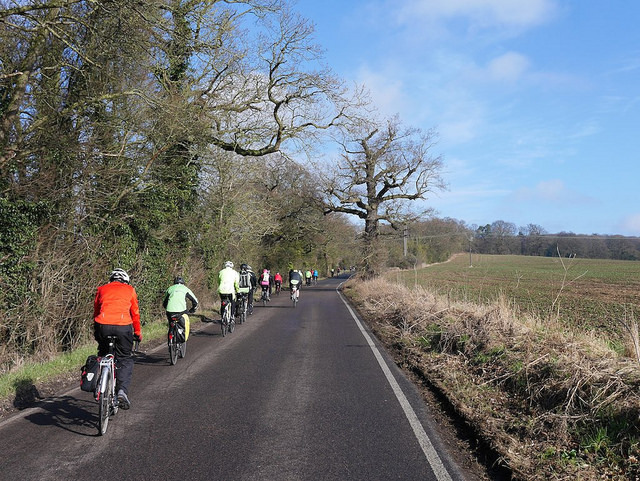 Our usual October Rainham ride was blessed with traditional fine weather and attracted a record participation. We were able to take in benefited an open day at Rainham Hall. 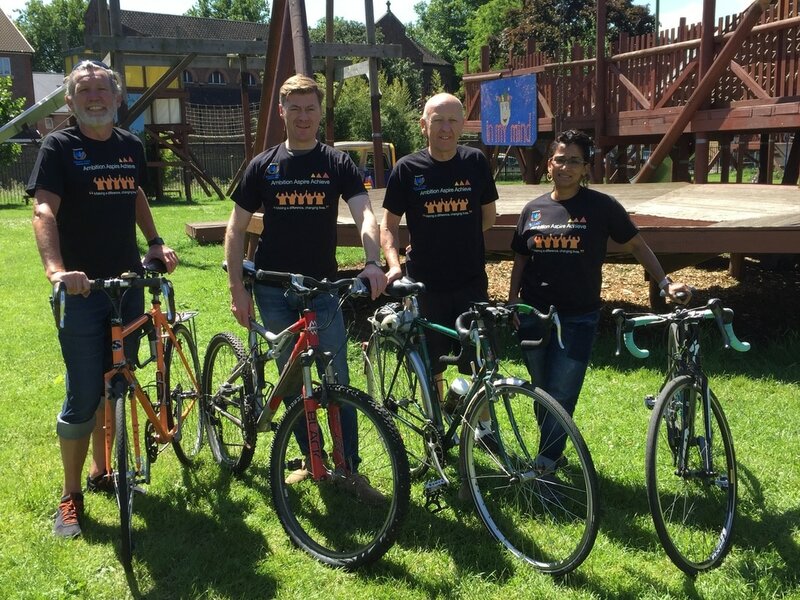 Another first was a ride for the children of the “Ambition Aspire Achieve” Saturday Cycle Club along the Greenway. 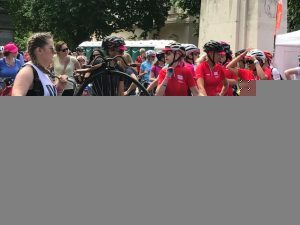 A late addition to the programme was a Newham Heritage Ride, as a contribution to Newham Heritage Week, using part of our familiar Newham Ride route with the addition of some historical sound clips provided by Eastside Community Heritage. Undertaken at Woodgrange Market in September and October and at Ambition Aspire Achieve in Canning Town in November. 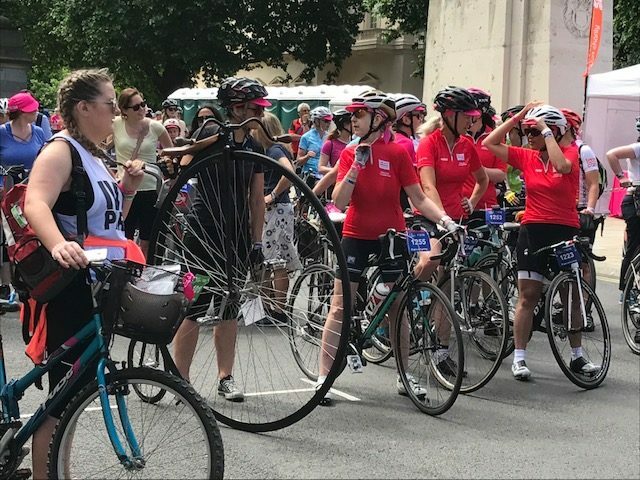 And after all that… We are now planning our activities for 2018, and running a fully subscribed women’s bike maintenance class over winter. Your can find here our November news . 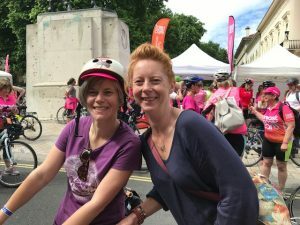 On Sunday morning, thanks to the nomination I received from the group, I got to ride in a celebration of Women’s Cycling, on closed roads in central London as part of the events preceding The Women’s Tour. 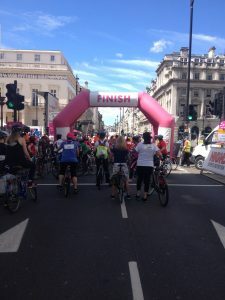 It was a short ride but the women taking part were all there because of the part they play in inspiring other women to ride – whether by providing training, or leading rides, or campaigning to make the city a place where women feel safe to cycle with their children. Some of the other LCC local groups were represented as was LCC HQ. 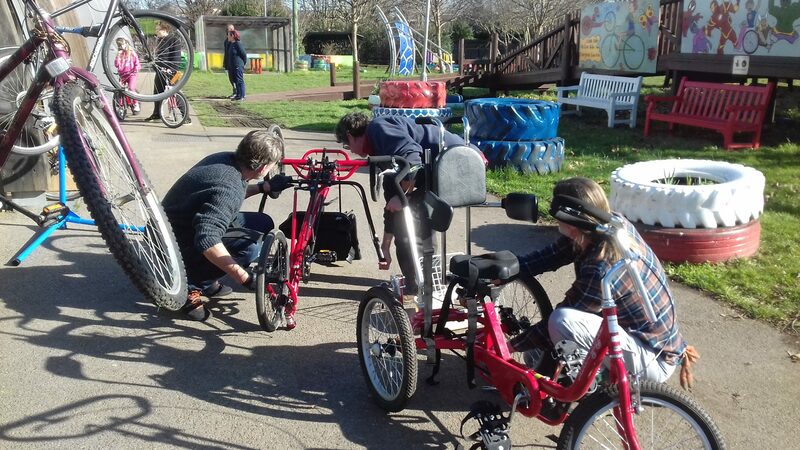 There were bikes of all shapes and sizes – cargo bikes, side by sides, an elliptical bike and even a penny farthing! 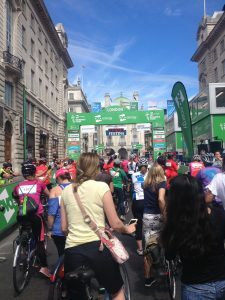 Both the Mayor of London and his walking & cycling commissioner, Will Norman, were there to wave us off as we rode out on part of the route that was ridden much faster later in the day by the elite women in the final stage of the Tour; along Piccadilly, Regents Street, Haymarket and around Trafalgar Square, before finishing on Pall Mall. 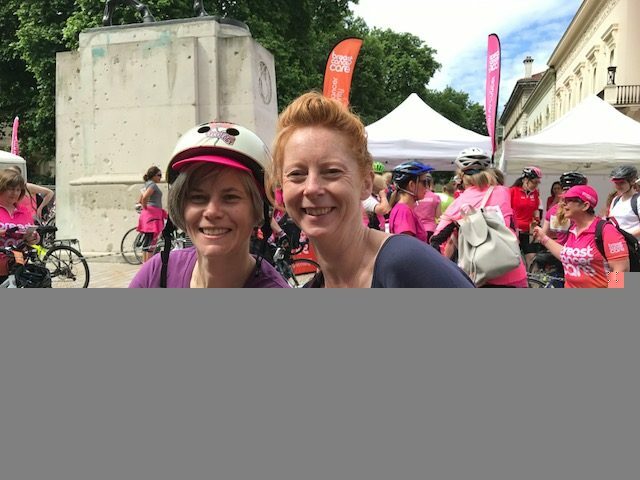 Author Kerena FussellPosted on 12th June 2017 Categories General cycling news, Girls Love Bikes Too! 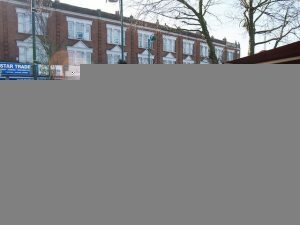 We will be meeting with Terry Paul & John Gray on Monday morning (14th December) at 8am at ‘The Rhubarb’ to discuss the various issues around Stratford, including plans for the gyratory, Warton Road and the changes at Sugar House Lane. Â Please join us if you can.